The Agricultural Hall in Islington was built by the Smithfield Club in the 1860s as a venue for their livestock and agricultiral shows. By the late 1800s, however, the hall was a popular venue for variety entertainment. Acts such as Eleonora, Queen of the Air stunned audiences with acrobatic feats, beautiful music and comedy performances. 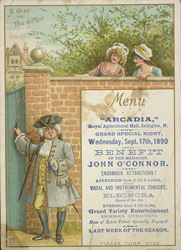 Benefit nights were a periodical custom in Victorian music halls. All the proceeds from the evening would have been given to a particular beneficiary - normally charities, or performers down on their luck. In this case the money went to the hall manager John O’Connor.